When a fire occurs, damaging your property, it can be a devastating disaster for you and your family in the Charleston area. Although a fire can do a lot of damage to your home, sometimes putting out a fire can be just as damaging than the fire itself. Fire damage can often turn into 3 disasters in 1; the initial fire damage, water damage, and smoke damage. The team at Clean Masters has the proper knowledge and the right equipment to get the job done correctly, efficiently, and in its entirety. The experts here know how to treat smoke, soot, and water damage in your home after a fire. damage. Always be sure to use a mask and gloves when entering a smoke damaged home. First, take pictures. This will become useful when it comes time for your insurance claim. Next, you’ll want to remove your salvageable belongings from the damaged area to prevent further damage. Wash everything that can be washed and wipe everything else down. Open up your windows to allow for ventilation in your home. You could even add a few fans to help get rid of the ash and dust. After you have done these things, you should wait for the professionals. They will ensure the damage is completely cleaned up and ensure there isn’t any additional damage beneath the surfaces. 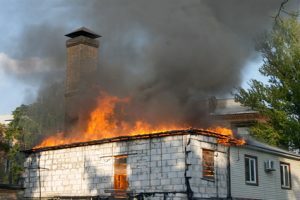 Water or fire can weaken the structures of your home and it’s important for a qualified professional to ensure that hasn’t happened, and fix it if it has. -Wash your clothing in cold water. Smoke and soot can be washed from clothing that can be bleached. -More fragile clothing should be dry cleaned. -Using 4-6 tbsp of tri-sodium phosphate can help remove soot and smoke off of your walls. Be sure to wash floors last. -Wash your pots, pans, and any other kitchenware with soapy water. -Using a damp cloth and even newspaper can help clean stiff leather. -Other items that are severely damaged should be left for the professionals to clean and restore. -Use baking soda on carpets and furniture. There is a range of sources of smoke odors that can impact the longevity of the smell. Many smoke odors can come from cooking fires, forest fires, or even cigarette smoke. The duration of the smoke can be a huge issue. A quicker smoke does not usually penetrate any of the porous surfaces deeply making the smell not last as long. The smell can be eliminated with a lot less effort than smoke from a wood burning fireplace. When you have smoke that lingers longer, the smoke can penetrate the porous surfaces deeply making the smell last longer and making it harder to clean out of fibers. Soot is very light and can travel through the air easier, making its removal a major priority. You should not put off cleaning smoke damaged items. Letting items sit too long with smoke damage can increase the cost of repair and also leave permanent damage to your items.